This Ain't No Picnic 2008 | A two-day celebration of music and DIY culture! A two-day celebration of music and DIY culture! We’d like to express a hearty THANK YOU to everyone who came to, played at, helped out with and generally believed in This Ain’t No Picnic 2008. The weekend passed by in an absolute blur and everything ran as smoothly as possible, for which we’re eternally grateful. Eternal gratitude is extended to the following people: Rob Hampton and all the staff @ KCLSU, Joey Joe Joe Junior Shabadooey Mahon, Mark Lewis @ Elastic Artists, Charlotte Moss and her team of awesome stewards (Emily Andrews, Julia Lambeth, Lauren Ding. Ashley Scarfield, Kerri Manning), Jamie jATPmie Summers, the lovely people at WeGotTickets, Sarah Fox @ lastminute.com, Kev @ BSM, all the bands who contributed tracks to the festival CD, Aaron Connolly, Ben Lancaster, Dan Reeves, Tori @ Badmoon, Mike Diver, Sean Adams and all at DiS, The Dreaded Press, anyone else who wrote nice things about us (please send them to us if so! ), Ricochet Ricochet for their awesome fanzine stall, the makers of Red Bull, Ryan Adams and, last but not least, Daniel Kelly for being the first person to buy a ticket. A massive thank you to Simon Tyers for putting this programme together. Check out his blog, it gets the STA stamp of approval. All festival artwork comes from the genius brain of Matt Littler. Check him out online at www.zikotown.com. If you run a label or a zine or something, give him some work. Not too much, though, as we want him back next time. super duper special thanks goes out to ALL OF YOU who came along and enjoyed the weekend. We’ll be back next September for another weekend, but in the meantime we’ll be running some smaller events. The first of these will be taking place on December 14th at KCLSU again. It’s going to be a Christmas party to remember. Unfortunately Fighting With Wire have had to cancel their appearance at this year’s festival. Shame! We’ve lined up Irish instrumentalists And So I Watch You From Afar to join the bill instead. They’re about to race around the country on a Rocksound sponsored tour, and we’re fairly sure they’ll tear your ears off. This brings us to a grand total of 34 bands playing across the weekend! Tickets for the festival are available now from lastminute.com and We Got Tickets. Why not check us out on Last FM and Facebook as well? Unfortunately, both Hooray for Humans and Panther have had to pull out of the festival. However, we’ve got a whole bunch of new names to announce in their place! There are still a few more names to come, we’ll be revealing them by the end of the week. Also, if you head over to the lineup page, you can see who’s playing which day! There’s still more to come as well! Finally, both day and weekend tickets are also now available from the nice folks at lastminute.com. Go! Buy! Hello! Welcome to the new This Ain’t No Picnic 2008 website. 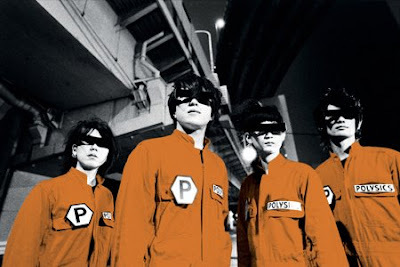 POLYSICS hail from Tokyo, Japan. Formed by Hayashi in 1997 and named after a brand of synthesizer, they’ve spent the past ten years fusing blasting guitars, computer noise, high energy beats and their love of American New Wave oddballs Devo to create a heady, energising sound that they dub “technicolour pogo punk”. We’re not going to argue with that. Over the last ten years released six full length albums and a number of compilations, whilst consistently wowed audiences with their energetic live performances and wild stage shows on numerous tours around Japan, the United States and Europe. Given all of this, we’re incredibly proud to welcome POLYSICS as Sunday night headliners for This Ain’t No Picnic 2008! It’s going to be something special. Get your dancing shoes ready! This Ain't No Picnic is a new music festival in London, brought to you by the people behind Smalltown America Records. Our aim is to put on a great day of live music featuring a smattering of bands you do love and a dollop of bands we think you'll love. This year's event takes place on September 27th and September 28th at King's College London Student's Union. Both day and weekend tickets are available now, and all proceeds from this event will be donated to charity, split between Cancer Research UK and The Connection at St Martin-in-the-Fields.